I was born in Hemel Hempstead and have therefore seen many changes in the town since then. I lived in Belmont Road which was completely surrounded by fields, woods and dells and in my early childhood spent many hours playing and picking wild flowers in the surrounding fields (I think I was sent to pick them to give my mother a break). At the top of Belmont Road there was a farm and my younger brother used to help with the milk round. There was also another farm down Belswains Lane. On the day war broke out I was at the top of Belmont Road with my dolls pram and I remember being told by someone that I should run straight home to my parents and I remember my father dashing off to pick up my older brother from Sunday school. My brothers and I attended Nash Mills School and also Nash Mills Sunday School. I remember a bomb hit a row of cottages near the Sunday school and we all went to have a look. The church had some cracks in the walls. The other side of the church from where the bomb fell there was another row of cottages in the end one of which lived my great grandmother who held the key to the church and also, I believe, kept it clean. When the war started my father erected a shelter at the top of our garden and we children used to get carried into it when the sirens went. This wasn’t the only bomb that fell in the area as one also fell in St Alban’s Road. As a teenager the New Town was developed and we used to watch all the new houses being built where we had once played and picked wild flowers. It was quite exciting but the farm was a casualty. Of course the whole of Hemel changed and some of the lovely old properties in the Marlowes were demolished. 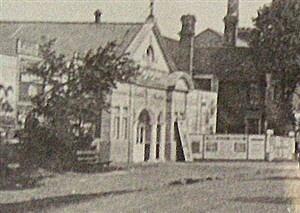 Also demolished were the Princess Cinema (which we called the flea pit), the Co-op store and butchers shop that was next to the Princess Cinema (which then was at the bottom of Midland Road) and also the Waterworks, which was where the college is now. As I got older I used to help my aunt (who was the manageress of a cake shop) on a Saturday morning. This shop was at the bottom end of the Marlowes, not too far from where the arch was. Where the magic roundabout is now there used to be a children’s playground where I used to go with my older brother. I also remember being taken by my mother along by the river there and falling in and having to be taken home in my younger brother’s pram. Its funny how things stick in your memory. The water gardens side of Marlowes was the first to be re-built and the Treasurer’s Department of the Council where I worked moved into the top floor above Stephyns Chambers so we had a good view of all the pile-driving work going on opposite our offices, although it was very noisy at times. There was also a dentist surgery on our floor and the dentist often popped into my office to keep an eye on his new car, which was parked in the road just outside. Many changes have taken place over the years; many of the original factories in the industrial area have gone and now, of course, so has the Pavilion.